We’ve moved house a few times, not out of choice mind, and each time I determine it will be the last temporary short-term residence thus leaving the personal stuff packed away in boxes & my treasured collection of pictures and paintings in bubble wrap. My view being there is little point in making a house a ‘home’ unless it’s yours for keeps and you plan to stay there for as long as you want (neither of which applies when you’re renting). I also have a slightly different take on what goes on around me, doing only what is necessary to keep things in order. Not so much of a ‘homemaker’ as a ‘make do-er’. But when we moved to Broadwindsor I had a change of heart and whilst the boxes remain in storage for the time being, I have taken the wraps off my pictures and hung them on the wall. I have also taken to gardening with enthusiasm. Within a short space of time I had weeded the vegetable patch to discover the remnants of rhubarb and potato. Not quite the same as rhubarb & custard I grant you, but a grand discovery nonetheless! And it was whilst I showed this horticultural vigour that our neighbour proffered a large bag of ‘just picked’ plums from their side of the fence. Now I am what you might call a ‘fair weather’ harvester with an eye for what I might do, but most of my effort is in the planning….my execution is somewhat less productive! However, faced with this generous donation and deciding it would be churlish to refuse combined with my resolution to enjoy our temporary abode, I determined to do something with them. The question was…..what?! 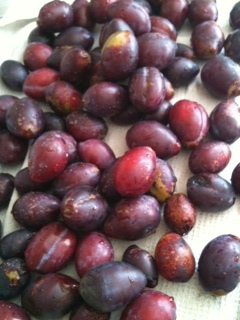 Thus I found myself with a large quantity of washed plums that needed de-stoning. It’s a messy business. The simple ‘slice in half & discard the stone’ became ‘hack each plum to bits, juice all over the side and brown finger nails’. Just add water and lemon juice and bring to the boil. Simple. Until you discover you are short of the next vital ingredient….sugar and lots of it! Having found one son, I persuaded him to go to village shop to buy supplies. I also discovered when a recipe calls for a ‘large pan’ , it means large and I soon discovered just how large as said son poured in 150kg of sugar! 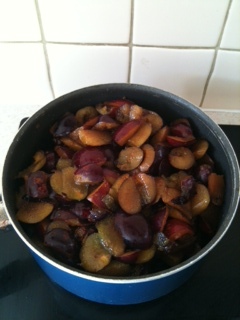 My jam learning curve was getting steeper by the minute….the pan was overflowing, grey curls of smoke arose as the boiled spirits of plums evaporated and the sugary substance running down the side of the pan onto the hob turned immediately to charcoal, only giving me a brief whiff of cooked plums before smelling like a burnt toast. Not to be beaten, I decanted half the mix into my other ‘big’ pan. The colour I have to say was quite beautiful, it reminded me of the witches’ cauldron in Snow White as the poisonous potion was concocted; the swirls moving around like writhing vicious red serpents seemed to be growing with each stir. But I followed the simple instructions and spooned some of the mix onto a plate to see if it was of a ‘setting’ standard. 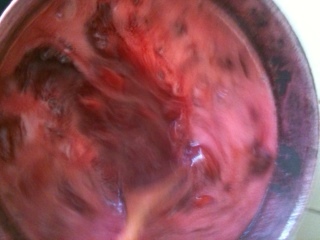 I was highly chuffed to see the Twitter text-book wrinkles as I pushed my finger through the red goo. A sure sign of setting success! Then came the moment of truth…..the tasting. I can indeed confirm it definitely had a plum flavour but also an overpoweringly sweet taste – seems that bag and a half of Tate & Lyle was a bit too much and the enamel on my teeth buzzed in terror as I tested the fruits of my labour. 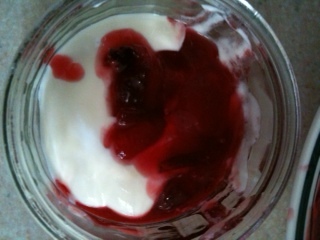 However, I was not about to discard 2 large pans of luxuriously red homemade plum jam and discovered the best antitoxin to the sickly sweet potion, was to give unadorned plain natural yoghurt an extra zing! This entry was posted in Life's Like That and tagged autumn, garden, harvest, homemaker, jam, moving house, plum, preserve, rent. Bookmark the permalink. 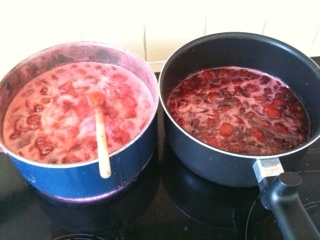 2 Responses to Jam….the preserve of the homemaker? 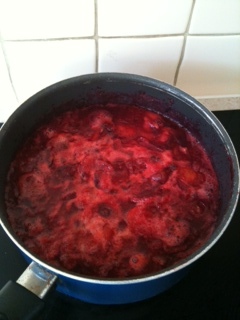 It’s not jam, but if it tastes good who cares !! Quite! 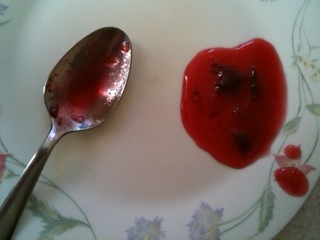 And it was so easy to make, I’m thinking of extending the line to include other foraged fruits!